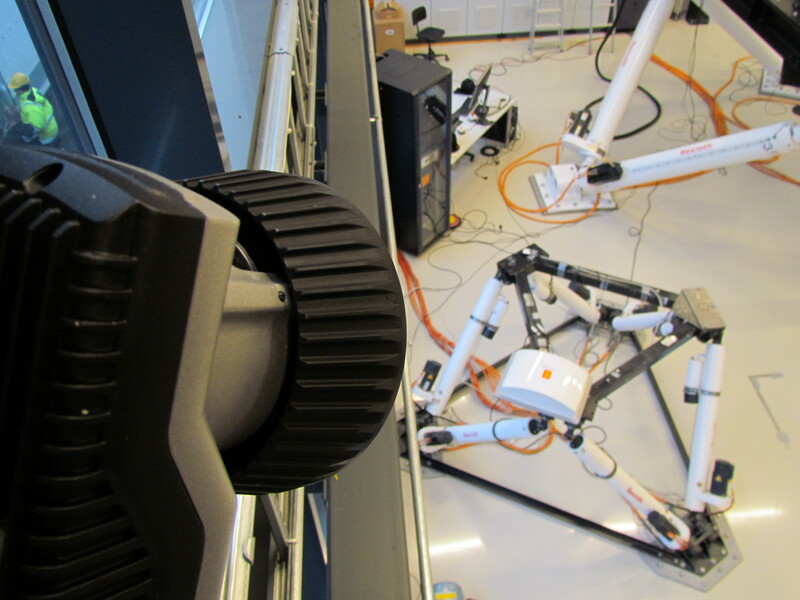 Norwegian Motion Laboratory has been established in collaboration with the Research Council of Norway, the Norwegian Centre for Offshore Wind Energy (NORCOWE), and the University of Agder (UiA) and it was officially opened in 2013. The laboratory is located at UiA, Campus Grimstad, Norway, approx. 3.5-hour drive by car south-west of Oslo. The main part of the laboratory are two six-legged robots (the so-called hexapods or Stewart platforms) which can simulate wave motions and two vessels floating in sea. In addition, the lab is equipped with an industrial robot that imitates a crane installed on one of the vessels, highly accurate laser trackers to measure position and orientation of the handled objects, and, recently installed, motion capture system from Qualisys. The fundamental research carried out in the Motion-Lab is currently centered around the topics related to the so-called vessel-to-vessel motion compensation, as part of the project SFI Offshore Mechatronics. In marine applications, it is often necessary to transfer loads between two ships, between a ship and a wind turbine (fixed or floating), or lower a piece of equipment to the seabed. Typically, these operations require a highly skilled operator who would be able to control the ship deck machinery in a smooth and undisturbed way despite the presence of wave-induced movement of the vessel. Therefore, the goal is to study various strategies for removing the sea motion from the handled object and to develop a framework to help human personnel to execute payload transfer operations in harsh offshore conditions as safely and efficiently as possible. This research can be carried out in the cozy inside of the lab before performing the experiments in real offshore environment. One of the key challenges encountered during motion compensation experiments is the assessment of the compensation accuracy, i.e. determination of the relative error of the position and orientation of the handled object from reference values. With the motion capture system installed in the Motion-Lab, which consists of 17 Oqus 700+ cameras that provide the full coverage of the lab space, this is not a demanding task anymore, as the complete six degrees of freedom information about the transferred payload is immediately available. – third-party assessment of accuracy of sensors used in offshore environment, e.g. light detection and ranging systems (LIDARs), motion reference units (MRUs), etc. would benefit from the additional source of measurement data that can be used to e.g. improve sensory systems currently available on the market, strengthen competitiveness of industrial partners, as well as increase safety of personnel during evacuation, escape, and rescue operations.